Guyana, a sovereign state situated on the northern coast of South America. Its capital and largest city is Georgetown. The flag of Guyana consists of green base on which a black-edged red triangle over a larger white-edged gold triangle is placed. It was adopted in May 1966. In Guyana's early history, the Arawak and Carib indigenous people inhabited the lands of the coast and interior respectively. These groups probably arrived in modern-day Guyana from farther south in South America. The Arawak people were relatively peaceful hunter-gatherers, while the Caribs were known to be fierce warriors, who wiped out many of the Arawak people in certain parts of South America and the Caribbean. Spanish explorers were the first to see Guyana, but the Dutch established the first settlement in Guyana in 1616, which was called Essequibo and was followed by several other Dutch settlements in the region. The Dutch used their settlements, which were situated along the rivers, primarily as part of their trade route, and they were controlled by the Dutch West India Company in 1621. 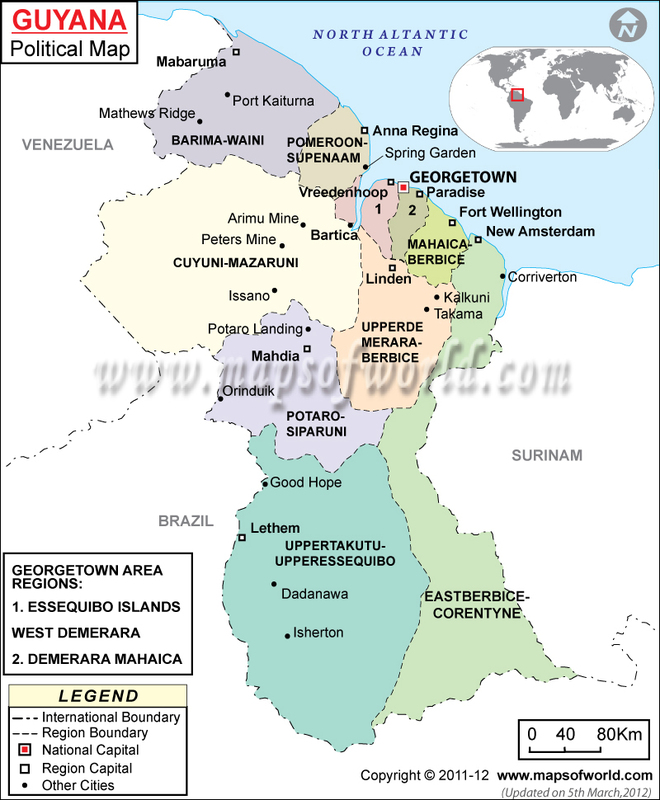 The second colony to be settled was Berbice in 1627, followed by Demerara in 1741. As their colonies grew and expanded, the Dutch began to use the lands to cultivate crops, including tobacco. The Dutch brought slaves from Africa to work on the plantations in Guyana, who rebelled in a famous uprising in 1763. The slaves were successful in overthrowing their captors, and the incident triggered a chain of other uprisings, and many Europeans were pushed out of the region until the Dutch regained control. British settlers began settling the region around 1746, and by 1781, the British and Dutch began to battle over the territory. The French became involved on the side of the Dutch, controlling portions of the territory for some time, and the Dutch regained control in 1784. By 1792, the Dutch colony became known as the United Colony of Demerara and Essequibo, and the colony of Berbice. The British took control of both colonies in 1796, but in 1802 they were returned to the Dutch. Finally, in 1814 the colonies were handed over to Britain, becoming British Guiana in 1831. Though border disputes erupted between Venezuela and Guyana, the colony was relatively stable. In 1966, Guyana became independent, joining the Commonwealth as a republic in 1970. Guyana shares borders with Venezuela, Brazil, and Suriname. Located on the north coast of South America, Guyana features coastal plains and marshy coastline, as well as rainforests, deserts, and mountains. The majority of the population lives along the coastlines, which are swampy and not sandy. Just inland from the coastal mudflats and swamps is a strip of low sandy hills. In the interior of Guyana are the highlands, with the Pacaraima Mountains in the west, home to Guyana's highest point, Mount Roraima, which stands 2,762 meters (9,062 feet) tall. To the south are the Kanuku Mountains and Acarai Mountains. The Rupununi Savannah is a region of grasslands and swamp lands, as well as mountains. Rainforests cover a large region of Guyana's territory, which serves as a habitat for many endemic species. Guyana has many rivers and streams, which is made evident by the fact that the country's name comes from a word for "land of waters." The longest rivers of Guyana are the Essequibo, the Courantyne River along the Suriname border, and the Berbice, and Demerara Rivers. Guyana is home to many natural attractions, including its vast rainforests, like the protected Iwokrama Rainforest Reserve. One of Guyana's biggest attractions is Shell Beach, where Leatherback Green and Olive Ridley sea turtles breed. As the land of water, Guyana has many rivers and streams, and also many impressive waterfalls, including Kaieteur Falls and Orinduik Falls, which can be experienced from above via plane tours. Other major waterfalls in Guyana are Kumerau Falls and 52 Drop Falls. The cities of Guyana feature colonial architecture, including St. George's Cathedral, one of the tallest wooden buildings in the world, and an ornate church building. The capital also features museums, government buildings, the main plaza, Independence Square, and the historic Stabroek Market. Guyana is also known for its rum, and there are distilleries around the country that can be visited on tours. Guyana's main international airport is Cheddi Jagan Temeri International in Georgetown, which offers services around the Caribbean, as well as flights to select US cities. Though Guyana does not have a railroad system, it does have roads from Suriname and Brazil, but not from Venezuela. Within Guyana, the minibus is a popular method of transportation, with frequent service and an extensive network, in and between the countries major cities. Taxis are another option for convenient and inexpensive travel.